We did it... we did it! I'm really proud of the boys for their willing (most of the time) involvement. They did a lot of the reading, and helped remind us when sometimes Kerry and I forgot. We soldiered through some of the tougher parts (like Leviticus and Chronicles), sailed through the familiar stories, both OT and NT, puzzled our way through parts we really don't understand, and drank in comfort, from God's promises. And it was all good. ... asked me if he could start his own blog. Outside my window... cold, frosty, sunny and bright. I am thinking... there are far too many Christmas cookies left in this house. I am thankful for... my family. I am praying for... Do not be anxious about anything, but in everything, by prayer and petition, with thanksgiving, present your requests to God. And the peace of God, which transcends all understanding, will guard your hearts and your minds in Christ Jesus. 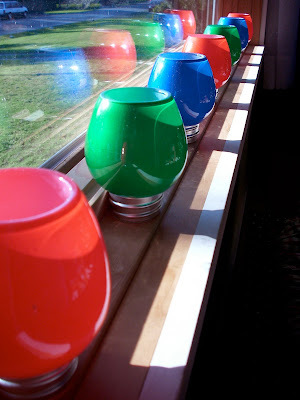 I am creating... a clean, bright, clutter-free house. I am reading... Training Hearts, Teaching Minds by Starr Meade... possibly next year's family devotions? I am hoping... to get our annual Christmas New Year's letter written. 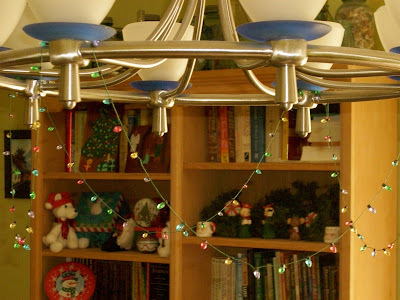 I am remembering... childhood Christmases. From the learning rooms... I'm not yet thinking about "organized" schooling, as we're taking another week off. From the kitchen... deep cleaning happening, way into the cupboards and everything. Around the house... I love Christmas. I love the anticipation, the celebration, everything. But when it's done, I like to move on. I have a lot of blue/silver/white winter things out now. On my mind... Wyatt, who is 13, still has four of his baby teeth, but Tate, who is 11, does not. Go figure. Noticing that... Gunnar is becoming a voracious reader! One of my favorite things... moving furniture. Making things look fresh. A few plans for the rest of the week... assembling Lego kits, reading new books, visiting with friends. Years ago, before we were married, Kerry did something he called "Great Circle" every Christmas. He would drive to his brother and sister-in-law's house - about half an hour from here - and spend time with them, then drive on to his dad's (and dad's wife's) house - another two hours away, then on to his step-mom's (and step-mom's husband's) house - another half hour, and he would usually visit his great aunt - about 45 minutes away - in an assisted living place. He might drop in on his friend's parents' house too. 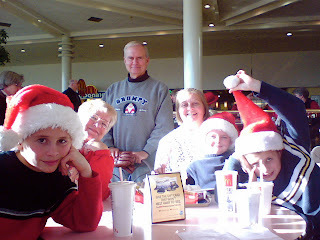 Then he would drive another couple hours (and a ferry ride) to see his mom, his grandma, and his aunt, uncle and cousins. Meanwhile, I had relatives about two hours from home that I sometimes traveled to on Christmas as well. Though these are all wonderful people, this whole idea of spending Christmas in the car (and trying to see everyone in one day) just wasn't working for me, much to Kerry's surprise, initially. A couple of years and a couple of kids later, along with a toddler and some stress-induced projectile vomiting, and he saw the light ;o). So now we have a family 'tradition' of staying home at Christmas. And by home, I mean in our home-town. We have our own family Christmas in our own home in the morning, and then join my extended family (just seven miles away) for a big Christmas dinner-which-is-lunch and the afternoon and evening. We see other relatives around Christmas. Then they get the boys' undivided attention, everyone is calmer, and - voila - no freaking out. 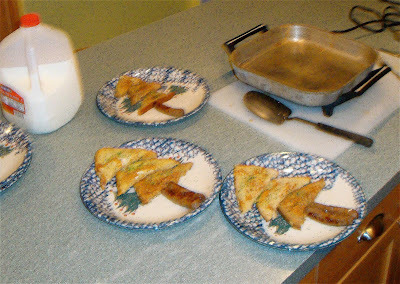 french toast Christmas trees with sausage trunks. Sorry it's blurry; I couldn't fix it. 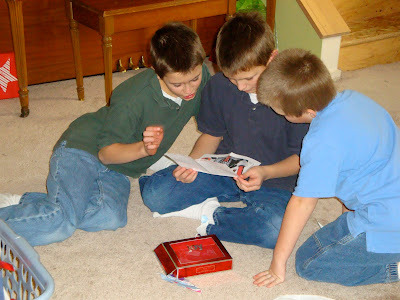 The boys discover that the book I ordered for them - the Lego Star Wars Visual Dictionary - is on backorder. Here they are, about to open a bulletin board, for their bedroom. Yes, they still get excited and giddy (me too!) but it's manageable. We had Christmas Eve at our house this year, as we often do. We keep it simple, since we're having a big dinner (lunch) on Christmas, and we want to go to Christmas Eve service in the evening. The boys are watching for Uncle Dave to arrive, since he's coming from out of town. We have a simple meal - soup, bread, crackers, fruit... and cookies. Gramma and Grampa Grasshopper and Kerry. Scout's honor, no alcohol was served this year. ... and two other happy boys! Wyatt even agreed to play his two Christmas pieces, since Aunty Tami and Uncle Dave weren't able to come to the recital. He played "Go Tell it on the Mountain", and "We Wish You a Merry Christmas". 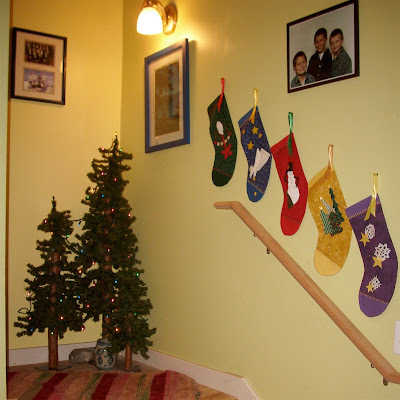 we hang the stockings along the stairs. 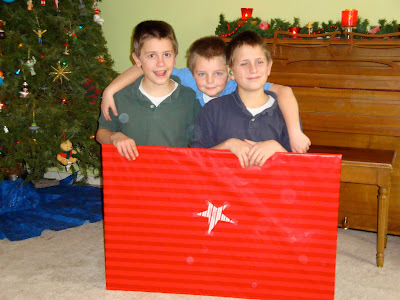 And some of my favorite boys at Christmas. and his brother in the black and white photo. I love holidays, especially Christmas. And, honestly, I enjoy a lot of activities that have little or nothing to do with the birth of Jesus... Christmas lights, hanging stockings, making cookies, etc. And I don't feel one little bit guilty about it either :0) I think building joy into the holiday, through traditions like these, builds happy memories and enhances our celebration. For the third year in a row, we've been using Ann Hibbard's Family Celebrations at Christmas as the basis for our Advent Devotions, and we'll probably get one more year out if it, before we move on to something else. The book contains two year's worth of devotions (December 1 - 24, so we adjust a bit, based on the first Sunday of Advent), as well as instructions for making an advent wreath, which we already have, and a Jesse tree and ornaments, which we've skipped. I have to admit, this felt awkward at first, because we'd never done anything like it before, but I'm glad we persevered. 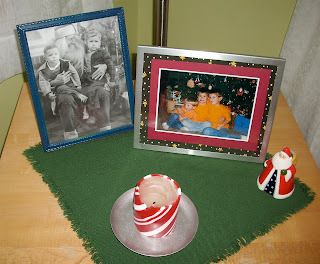 The boys got used to it :0) They participate, they're eager to light the candles, and they even sing, which I love. Each day's devotion takes only about 10 minutes. They include a short introduction or story, a Bible reading, a few questions about the Bible reading, an explanation (of where the author was intending to go with the questions), a prayer, and a suggested Christmas carol that goes along with the day's theme. 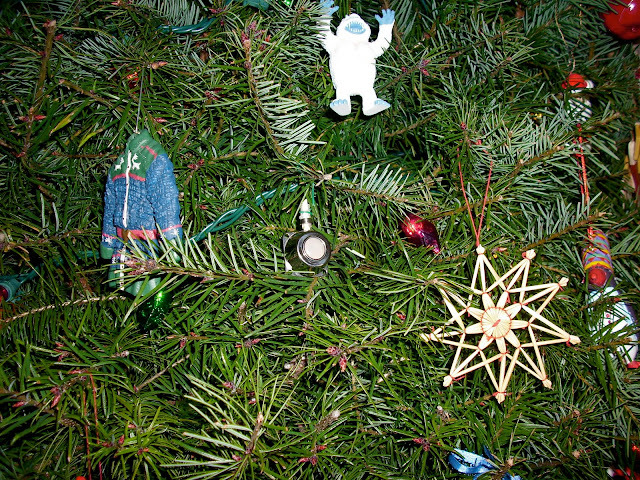 We've skipped the whole Jesse tree and ornament because it felt redundant, but some kids might really like that. There are also additional verses for reflection, intended for adults or older kids, which we've sometimes included and sometimes skipped. I'm glad we found her books. (She has similar devotions for Easter, Thanksgiving, and All Saints' Day.) Though they're written for younger kids, they've held Wyatt's attention to and been a simple way to ease into family devotions. I didn't this year, but last year posted several times about what we were reading in our devotions. If you're interested you can read through last December's posts. 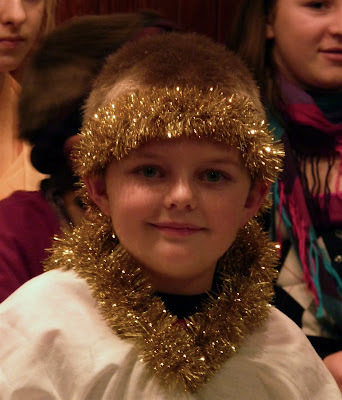 Our church had a children's Christmas program last night, and it was just exactly right. Gunnar, waiting to say his lines. Not perfect... oh no, not perfect. It had all the usual imperfections. Kids that weren't quite sure when to enter or exit, a little angel that appeared to want to remove her costume, someone saying his line too soon and being loudly SHUSHED by another little boy, and the requisite preschooler picking his nose, in the front row. But it was just right. The story is familiar. We could say the words by heart, from the first and second chapter of Luke. Mary. Joseph. Baby Jesus. Shepherds. Angels. 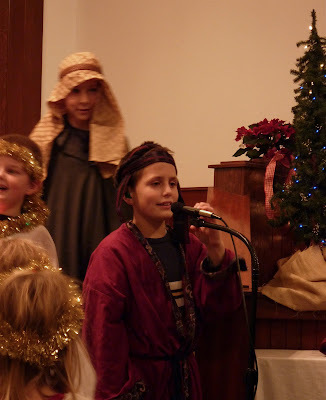 In the typical fashion of our little church, there was no "overcooked ham" in this show. No auditions or weeks of lengthy rehearsals. The kids brought home their verses after Thanksgiving, had two Sunday mornings to practice, were costumed in bathrobes and tinsel, and nobody got stressed out about it. All the kids participated, from preschool to high school - about 40. They sang carols, and in case they didn't remember all the words, two of the college students - brothers - manned the overhead, projecting the words on the back wall of the chapel. Tate, "Glory to God in the highest!" I love the way everyone participates. In the past, my boys - not interested in being 'stars' - were content to be spectators. But here, everyone participates. 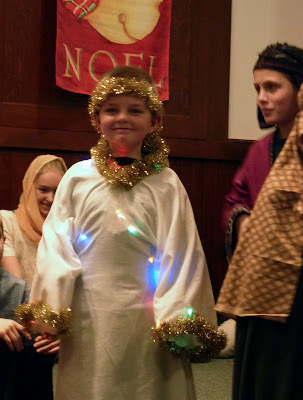 As someone recited, "An angel of the Lord appeared to them, and the glory of the Lord shone around them...."
Gunnar, in all his glowing glory! ... he flicked the switch. Outside my window... dark, drippy, dreary. I am thinking... it is really the shortest, darkest day of the year. We've already been to the orthodontist and back, and had the headlights on the whole way. I am thankful for... how cozy and warm it is inside. I am praying for... the phone to ring. For Kerry. WORK. Please. I am going... our MIT group is getting together today - a very low-key Christmas party. I am hoping... Phone. Ring. Work. I am hearing... rain dripping down the gutters, wind in the trees. From the kitchen... leftover turkey for tonight. Around the house... candles, Christmas books, and the lovely smell of our Douglas Fir Christmas tree... which smells more and more as it dries out and dies. On my mind... I need to have a master calendar reconciliation. The one on the fridge, that everyone scribbles on, the one in my purse that is my "paper brain", and the Master Calendar on my desk, that I keep, to remember. Noticing that... the squirrels just love running around on our roof. And our gutters so desperately need to be cleaned, that the squirrels are probably planting trees in them. A nativity that my "Nana" made. For as long as I can remember we've kicked off the Christmas season with a Christmas craft just as soon as we clear the Thanksgiving table. We've made a variety of Christmas tree ornaments, stamped Christmas cards and gift tags, and many other things I don't remember just now. For years my mom - Gramma Grasshopper - and her sister, my Aunt Judy, headed this up. But now it's usually up to my sister, cousin, and myself. 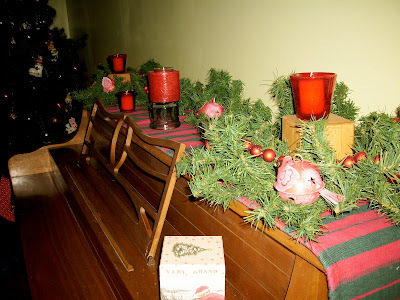 This year we decorated candle holders - mostly for votives, but some larger ones as well. It's easy. I promise. Or I couldn't do it! We collected an assortment of clear glass candle holders, lots of tissue paper (white, colored, and printed), and a few other items - tiny glitter stars, rub on words, and some glitter snowflakes, and Mod-Podge. (Yes, I know... remember the 70's?) You could mix Elmer's glue with water if you don't have Mod-Podge. 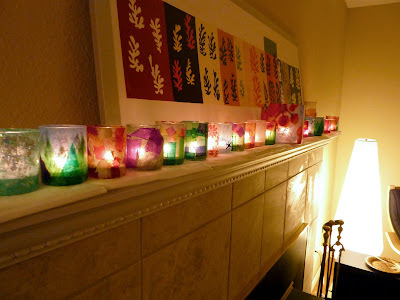 All these lovely candle holders were made by ripping or cutting the tissue paper into small pieces and "painting" them. 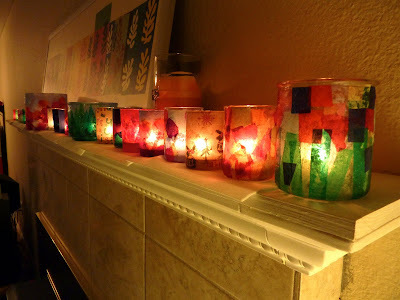 layer by layer, onto the candle holders with the Mod-Podge. You know how sometimes you find your way to the blogs of complete and total strangers? So, this morning I was reading a blog I like. Clicked on the profile of another commenter. Checked out that person's blog, briefly. Saw an interesting blog title in the sidebar, clicked on that. This was a guy's blog, and the title that caught my eye was something along the lines of "Stuff I Think About", and don't women always wonder what men are thinking about? The last entry was in May. And the one before that was in January. So.... he's been spending a lot of time in his "Nothing Box"? Fret not, the frog is fine. Mama, what day is it? I point Gunnar to the calendar. Oooooh. Is it December 17? In just one week it'll be Christmas Eve. And all the kids will be JITTERY! Yes, I know the block in the middle breaks the pattern. I didn't have quite enough of that blue. Oops. That is Gunnar's favorite part of the quilt... because it's different, I guess. When I realized I was short I thought about making that block "spin" the other way, but I didn't. Maybe I should have... but too late now! The backing... well, I have a ton of that. 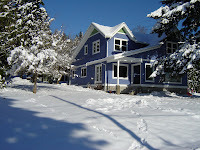 At one point, back in our old house (which we sold in 2003! ), I was going to make a shower curtain out of that and I think I bought four yards. I'm still using it. I am thankful for... shopping DONE. I am praying for... thankful, gracious hearts in the boys (and us), over the Christmas season, and more work for Kerry... who is about out. I am wearing... layers. Jeans, wool socks, purple sweater. II am creating... a baby gift, picture below. I am going... staying HOME. I am reading... we finished the Little House books - yea! We enjoyed them greatly, but I'm looking forward to something new. I continue to read bits of Elisabeth Elliot's Keep a Quiet Heart. I am hoping... to have some friends for dinner this week. I am hearing... the washer spinning, the boys puttering. From the learning rooms... a happy mess. For some reason I've been doing the gift-wrapping in there. Probably because my office is taken over by a sewing project. Around the house... My Organizing Mommy friend would be proud of me. When it started snowing yesterday there was a chance the family party could get shifted to my house. I didn't think it would, but just in case... we came home from church and did a quick Family Blitz. Sweeping, vacuuming, swiping out toilets. Everybody helped. Their driveway gains between 600 - 700 feet in elevation over a mile, (what's that, like a 12% grade? ), and it's very wind-y. Let's just say it was an exciting ride down last night. Not the kind of excitement I really like. from an Amy Grant Christmas CD. One of my favorite things... watching the boys reconnect with cousins they don't see very often, seeing relatives that I don't get to see very often, and everyone having a good time. 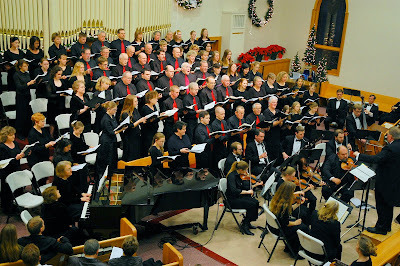 To perform one man’s great gift to sacred music. Of astounding complexity and intricacy. To be shouted from the soul, wrung from the heart. Honoring faith foretold, realized, proclaimed. And a nimble organist with flying feet and fingers. The bass voices full and resonant. In parallel duet of counterpoint melody. As if in oft repeated familiar prayer. A year ago, recovering from a tonsillectomy, I wistfully skimmed over the call for singers. 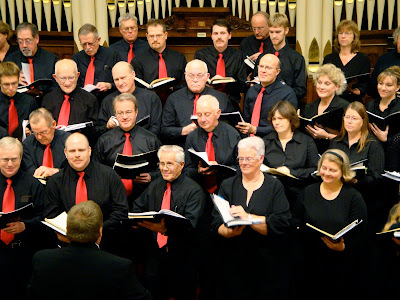 But this year I joined in, along with several from my church, making up a nearly eighty voice choir, accompanied by a chamber orchestra. Magnified by three attentive faces, in the second row, dutifully following along in the guide I had prepared for them. And the encouraging smiles radiating up at me every time I looked their way. I'm hoping to add this to our Christmas traditions. 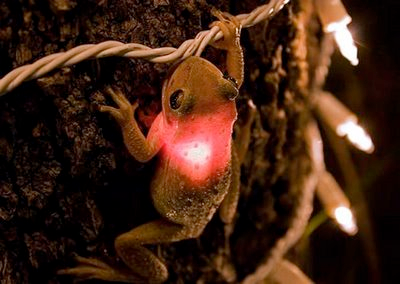 You put WHAT on your tree? Our Christmas tree is eclectic. We like it that way. 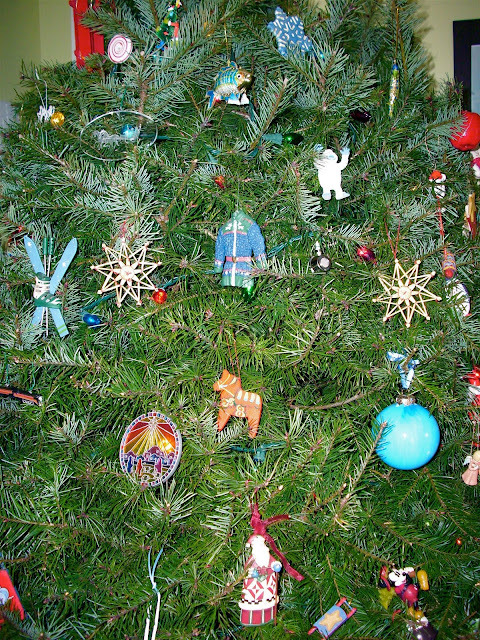 No two ornaments are alike, and most of them represent something... a memory, a friend, a symbol of Christmas. A Mickey ornament from our family trip to Disneyland, a Japanese ball given by my Japanese "sister", stars, angels, and a Bethlehem scene. But there's one ornament that really is unlike all the others. And even if you can pick it out, do you have any idea what it is? It would probably help if you have some kind of medical background. You're looking at Kerry's Port-a-Cath. When we met, Kerry was going through chemo and radiation, to treat Hodgkin's Lymphoma, and the port was a "convenient" way to receive therapy without puncturing his veins, repeatedly. He was really, really sick. After we married, and he'd been well for a few years, his oncologist suggested removing the port. Though the surgery was minor, the message was major. You don't need this anymore. In celebration, Kerry twisted an ornament hanger around the top of the port and every year we give it a prominent place on our tree. I think I've mentioned that I don't like clutter. I've certainly mentioned it to my boys frequently. I don't mind as much about the playroom, or even their bedroom, but I want the living room to stay tidy. They're pretty good about keeping the common areas picked up, so I was somewhat mystified to find the same CD left out on the floor, day after day, when I hadn't heard it playing. Guys, why is this Tchaikovsky CD sitting on the floor again? They've been taking it into their little CD player in the playroom and using the 1812 Overture as a soundtrack for their Lego pirate battles. Outside my window... cold, clear sunny day. The bare branches are tossing in the wind. I am thinking... 17 days before Christmas. So, of all the things I'd like to get done, which are most important? I am thankful for... we had a fun but BUSY weekend. 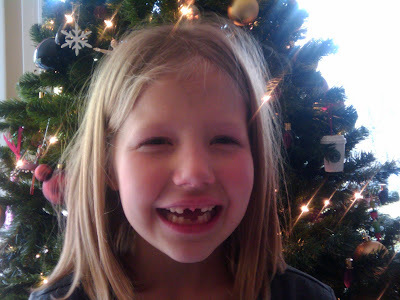 (PTO day - project day, church, Tuba Christmas, and two Messiah performances.) As much as I liked all the parts of it, I'm glad it's past. I am praying for... right Christmas priorities. I am wearing... jeans, dark green sweatshirt, a turtle neck that is printed with swirly strings of Christmas lights, wool socks. I am hearing... the wind. I love how it makes different noises going through the different trees. I am remembering... wishing and praying, as a child, that it would snow on Christmas. From the learning rooms... line plots and bar graphs, writing a narrative paragraph, starting through Janice vanCleave's chemistry experiments, memory verses for the Christmas program, the Turkish siege of Vienna, and Turkish Delight. From the kitchen... pork roast in the crock pot. On my mind... thinking that after we finish the Little House books I should read the boys my great-grandmother's book. She was born shortly after their - Laura and Mary's - time (later in the 1800's) and grew up in Kansas and Oklahoma before moving to the PNW as a young wife. My brother - a fan of all things Disney - is giving us a 'tour' of a scale model he's making of Disneyland. It's a festive weekend for us. Full of music. For Kerry, that means Tuba Christmas. 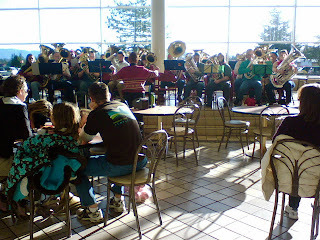 Apparently, Tuba (and euphonium, aka baritone horn) players gather all around the world, to play Christmas carols, arranged for low brass. For once, they get to play something that doesn't just "oom-pah", and *gasp! * even get to play the melody! Well, they have to, because this is low brass, and all low brass. Loads of fun, people, loads of fun. 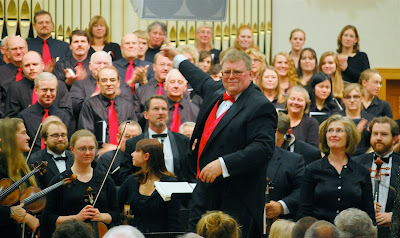 The conductor is from the local university. She plays tuba herself. 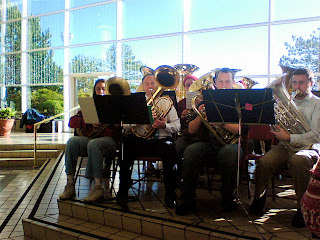 In fact, she has a music group of all tubas. I've never actually heard them, but they've been described as being "as eloquent as singing whales." That's meant to be good. Interesting good. 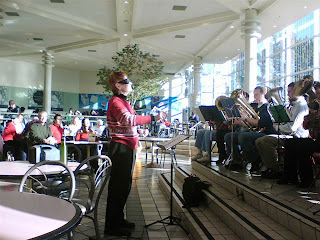 It's a sunny day, so she's wearing her shades to conduct. They had a great turnout this year! And there's my baritone player, tooting away. And all the little grasshoppers, with Gramma and Grampa Grasshopper. 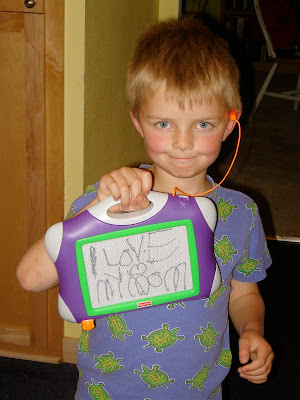 Oh, and PS... my brilliant son brought his camera, as instructed, and then left it in the car. A fact which I realized only as the performance was about to start. There was no way I was fighting my way through the shopping maul, to the parking lot, and back again, so these photos were graciously provided by my sister and her cel phone. I've been preparing the boys to attend Messiah tonight, especially Tate. Knowing that it will be hard for all of them to catch all the words that are sung, I've printed them all out. I've also given them things to listen for in most of the songs/pieces. Like, "Listen to the strings. Thousands of angels have just appeared to the shepherds. Can you hear the beating of their wings?" 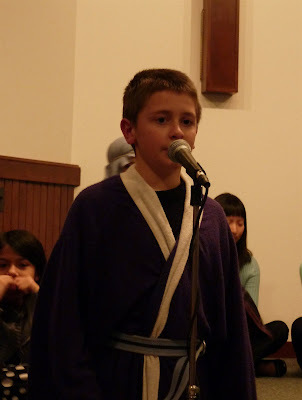 And I've been explaining different musical techniques, like the way the voices make interwoven harmonies and then emphasize other words by singing them in unison. I ignored him and kept mouthing and singing the words for Tate. I gave him the raised eyebrow. "I'm not interrupting you, I'm singing." "Well... then quit sing-errupting me!" I've mentioned my bloggy soul-sister. You can find her at the link just below. Her "thing" is organizing. Right there you know I like her. And she lives in the real world. Because it just irritates me to see photos, usually in magazines, of houses that look too perfect. Like nobody actually lives there. They wouldn't dare. They'd mess it up. Makes me want to stomp in wearing muddy shoes and drop some bags of groceries in the middle of the floor, just to see what would happen. 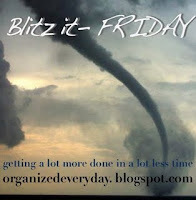 My Organizing Mommy friend suggests a one hour blitz. You can read about it on her blog. Basically, you work like a maniac for an hour and see how much you get done. Not the sit-down jobs, the running around the house, tidying and cleaning jobs. But I needed to so some sit-down jobs, too, so I compromised, and did some of each, and took two hours. This was what I saw as I walked into my office. Too much stuff everywhere, and no room to work. I still have a project on my desk, but just one, and my supplies are tidier. My desk was like the leaning tower of Pisa. Ugh. And it's mostly bills. Double ugh. Now I have room to deal with all those papers. I need the ironing board in here when I'm sewing, but the rest of the time it's in the way. And it accumulates more clutter. Now I can get to the closet. For me, a cluttered environment equals a cluttered mind. I can't function very well in the midst of disorder. So I may not have accomplished many of the tasks I need to do, but having a tidy environment energizes me to get onto them.